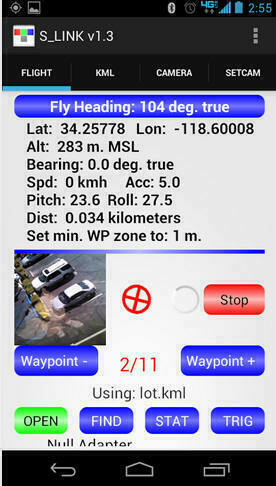 APP Description: S_link is the mobile version of Tetracam's SensorLink application. Able to run on cell phones and other mobile devices equipped with Android 3.0 and up, S_link enables users to define a set of waypoints above an area of imaging interest shown on Google Earth. Each waypoint identifies a location where a Tetracam multi-spectral camera that is equipped with a Wireless Camera Interface (WCI) is to be triggered and capture an image. 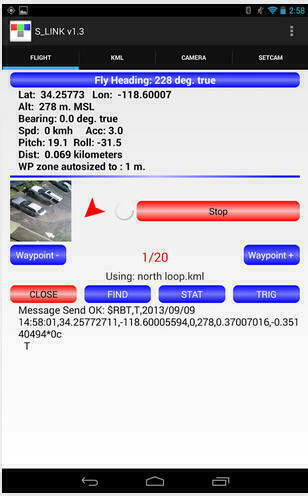 The App employs the mobile device's GPS receiver and Bluetooth® interface to (optionally) send GPS coordinates, attitude data and trigger commands to the Tetracam camera. Images are written into the camera's onboard memory with location and device attitude data transferred from the mobile device to the camera via the Bluetooth® interface. Use Google Earth to create a path then save it to a kml file. 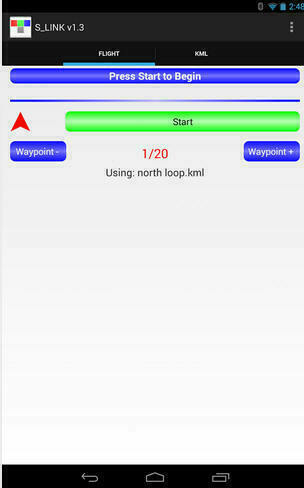 Each click on the path should represent a waypoint. Copy the kml file to the Download folder in your device storage memory. 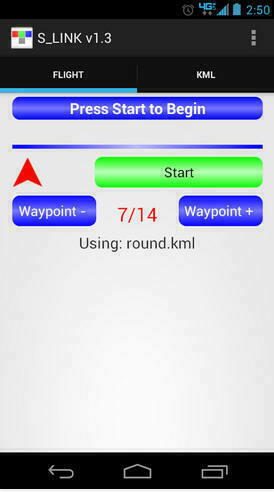 Run S_link and select your waypoint file on the KML tab. 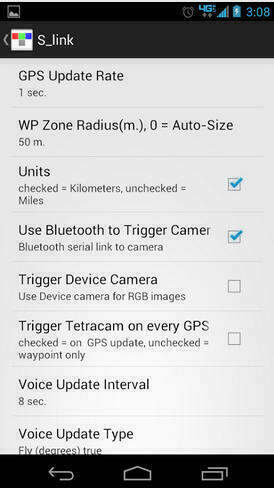 To trigger the camera, first pair the camera's Wireless Camera Interface Bluetooth serial adapter to your mobile device then select it from the list of all paired Bluetooth devices on the CAMERA tab. Finally, enable camera triggering on the Settings dialog. Now, press Start! 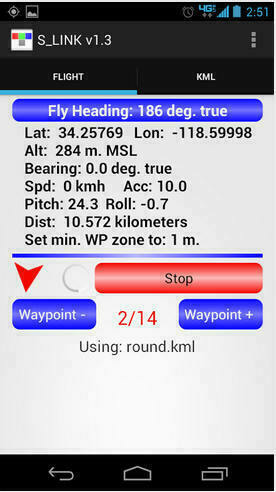 The app will use the device GPS receiver to give you a heading and distance to the next waypoint. 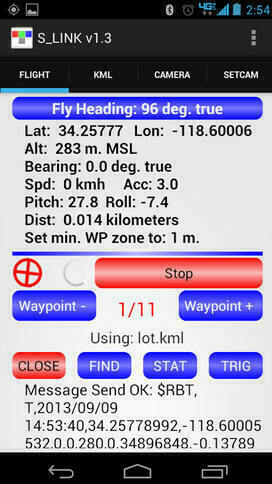 When you acquire the waypoint, if your camera is equipped with a Wireless Camera Interface, S_link will send it the current location data along with a trigger command. 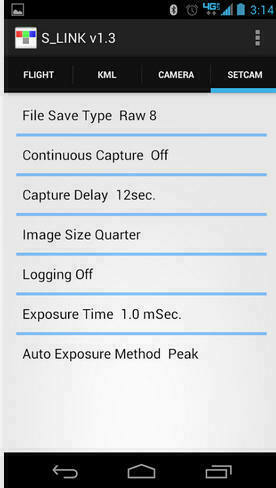 Use the SETCAM tab to send configuration orders to the camera, change file type, exposure time etc. 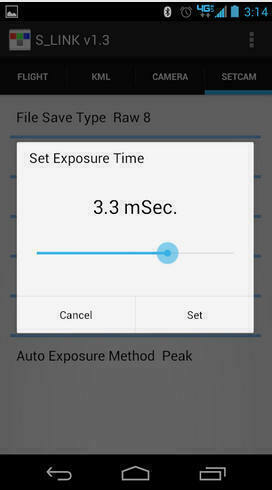 The Settings dialog lets you select GPS update rate, waypoint tolerance zone size, the units (km or miles) you see on screen, voice messaging rate and type and whether to use Bluetooth for camera triggering. Use the scroll bar to view example App screens at right. Notice: This app is not qualified for any aspect of flight control.